Glucocorticoids are widely used to treat varieties of allergic and autoimmune diseases, however, long-term application results in glucocorticoid-induced osteoporosis (GIOP). Inflammatory cytokines: tumor necrosis factor-α (TNF-α) and interleukin-6 (IL-6) play important regulatory roles in bone metabolism, but their roles in GIOP remain largely unknown. Osteocytes can modulate the formation and function of both osteoblasts and osteoclasts, directly via gap junctions, or indirectly by transferring molecule signaling. Apoptotic osteocytes release RANKL, HMGB1 and pro-inflammatory cytokines to stimulate osteoclastogenesis. 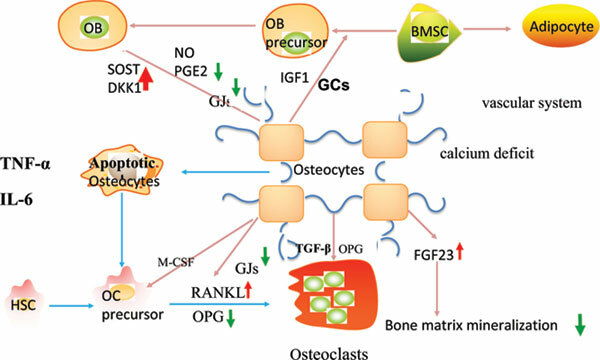 Moreover, osteocytes can secrete FGF23 to regulate bone metabolism. Exposure to high levels of GCs can drive osteocyte apoptosis and influence gap junctions, leading to bone loss. GCs treatment is regarded to produce more FGF23 to inhibit bone mineralization. GCs also disrupt the vascular to decrease osteocyte feasibility and mineral appositional rate, resulting in a decline in bone strength. Apoptotic bodies from osteocytes induced by GCs treatment can enhance production of TNF-α and IL-6. On the other hand, TNF-α and IL-6 show synergistic effects by altering osteocytes signaling towards osteoclasts and osteoblasts. In addition, TNF-α can induce osteocyte apoptosis and attribute to a worsened bone quality in GCs. IL-6 and osteocytes may interact with each other. Therefore, we hypothesize that GCs regulate osteocyteogenesis through TNF-α and IL-6, which are highly expressed around osteocyte undergoing apoptosis. In the present review, we summarized the roles of osteocytes in regulating osteoblasts and osteoclasts. Furthermore, the mechanism of GCs altered relationship between osteocytes and osteoblasts/osteoclasts. In addition, we discussed the roles of TNF-α and IL-6 in GIOP by modulating osteocytes. Lastly, we discussed the possibility of using pro-inflammatory signaling pathway as therapeutic targets to develop drugs for GIOP. TNF-α, IL-6, osteocytes, osteoclasts, osteoblasts, GIOP.